I've ordered my Christmas cards from Shutterfly for the past few years and I have always been pleased. Their cards are high quality and their customer service is fantastic. My cards have always arrived quickly and I'm always excited when they arrive. 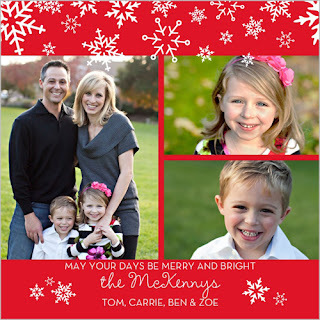 Shutterfly always has a wide variety of holiday and Christmas cards. Whether you are looking for religious Christmas cards, Christmas party invitations or traditional Christmas cards - Shutterfly has something for everyone. I promise that you will find a card that you love, one perfect for your family.